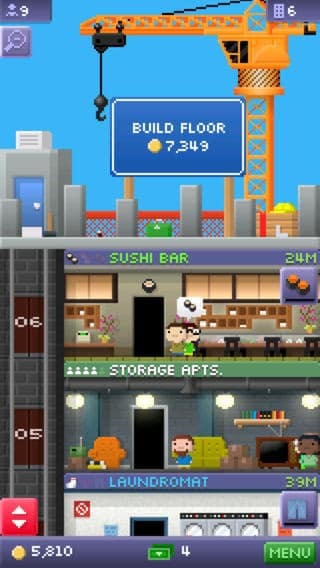 Tiny Tower iTunes App Review by Applerepo.com. Tiny Tower is one of the most popular games out there for the iphone, ipad and ipod touch devices and the great news is that it is available completely free of charge. The idea of the game is that you run your own tower in which you will have residents to keep happy and businesses. The game is very retro in its feel and the interface is reminiscent of the old Mario games on Nintendo consoles. This is due to the pixel nature of the game which actually adds to the game play rather than take away from it. Tiny Tower app is quite a simple game in which you simply have to earn money in order to be able to build new floors for your tower and therefore get further in the game. Money is earned through business revenue and of course the rent from those that live in your tower. The game is extremely addictive and you will soon find yourself spending hours of your day making sure that everything is running smoothly. 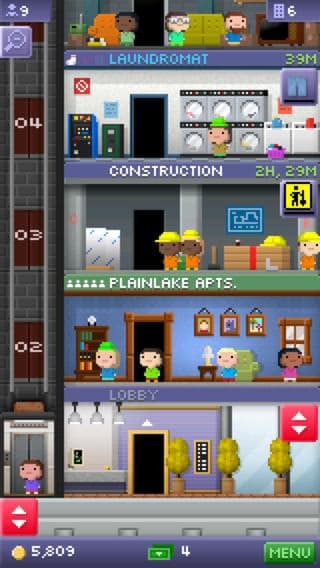 A great thing about the Tiny Tower iphone game is that there are really so many different types of businesses that you can have in your tower and so many different things to do that there is hours to enjoy. The game also allows you to use real money to buy in game cash or tokens which will ease the difficulty in many situations. It is also connected to game center so you can compete with your friends.